The Dark Knight - this was one of the few movies I saw in the theater. I had very high expectations going in, but was not as blown away as I had hoped to be. Still, Heath Ledger's performance warrants a spot in the top 10. Juno - another great date movie. Dexter - I watched season one in about a week on Netflix. Season two took me a little longer, but I was just as committed. Dexter is a very interesting character. Like Gone Baby Gone, it raises lots of questions of good and evil, as well as our struggle to hide our sin. It should be noted that this Showtime series is definitely R-rated. This past Sunday night we had a Night of Remembering and Giving Thanks. I decided that I wanted to "remember" the great things that God has done this year, so I'm including a top 10 list of moments/events. Micah - Micah is such a wonderful baby. He is full of joy and always has a smile to share. The fact that he doesn't cry that much and sleeps through the night is definitely a plus. I am so blessed to be the daddy to two wonderful boys. Dad - Dad's surgery was definitely a little scary, but I am very thankful that everything went as smooth as it did. I know that God was involved in a major way. Adam and I went to see him yesterday and he was continuing to recover well. Vacation to St. George Island - We got to spend a week on the beach with Mandy's family. We wondered how it would be with a three week old, but Micah did great. It was a beautiful place, and a much needed rest. Kaboom and CYPN - When we moved to Cooper-Young to start a church, we wanted to be about the neighborhood. We wanted the neighborhood's needs and desires to become our needs and desires. The Kaboom Playground build at Peabody Elementary School and the formation of the Cooper-Young Parent's Network were two tangible steps towards this. Changing jobs yet again - This year I went from the mortgage business to the property management business. I went from zero properties in June to fourteen as of today. I really enjoy it, and it serves as a great support system for church planting. MCAP - I met Hugh Halter and Matt Smay at the Exponential Conference in Orlando last April. In May I was given the money to go through their seven month online coaching program. It just finished, and I gained so much through it. Neighborhood Church - this year I felt that we moved from being a church plant to becoming a church. It seemed to have happened sometime this summer, but it definitely feels that way now. Third annual toddler Halloween party - our party in 2006 was one of the first parties we had. It feels good to say that we've done something three years in a row. In February we'll have our third annual Super Bowl party. Advent Conspiracy - we just finished up our second year of participating in the Advent Conspiracy. I think this is one of the best things our church did this year. The highlight was the "Think Globally, Party Locally" Party hosted by Josh and Ginger Spickler. I decided to compile year end top 10 lists again this year. First up is a list of my favorite books for the year (in no particular order). The Tangible Kingdom, by Hugh Halter and Matt Smay - actually this is in order. This was my favorite read of the year. It's also the book I've recommended the most to others. Walking with God, by John Eldredge - our church spent the summer talking about abiding with Christ. For me, this book played a major role in those discussions. Humility, by C.J. Mahaney - I just read this and gave copies to our leadership team. It's heavy hitting at times, but extremely practical. The Myth of a Christian Nation, by Gregory Boyd - I participated in a six week discussion on this book in the spring. It's a needed book for many in our culture, and I think it really resonated with those in the discussion group. The ESV Study Bible - I've already written on how much I am loving my new study Bible. You can read that here. Culture Making, by Andy Crouch - I try to read anything that Andy Crouch writes. He has a great grasp on what it means to share the gospel in our culture. Transfer of Power, by Vince Flynn - if you like Jack Bauer, you'll like Mitch Rapp even more. There are nine books in this series so far, and I read (or listened to) seven of them this year. Holy Discontent, by Bill Hybels - I finally read this when I was preparing to teach about how the Gospel impacts society. It's a quick read, and very inspiring. Authentic Parenting in a Post-Modern Culture, by Mary DeMuth - Mandy came across this book and read it, then recommended it to me. I read most of it sitting on a beach in Florida last summer. Mary and her husband are missionaries in France, so they understand what it means to raise children (and teach them a Christian worldview) in a post-modern/post-Christian culture. The Blue Parakeet, by Scot McKnight - I actually am not very far into this one, but I've read enough that it counts for 2008 (my rules). 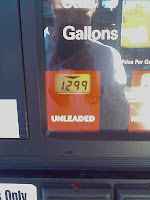 I waited until I was on empty before using my $.10/gallon discount from Kroger. A few months ago it would have cost me close to $50. Today it was $17! The surgery is over and everything went well. We just spoke to the surgeon, and will get to see Dad in an hour or so. It's been a long day, but we're all grateful that everything went well. He ended up having a triple bypass, but the doctor said that his heart is very healthy. Surgery is now scheduled for Wednesday afternoon. We were hoping for this morning, but he is ok waiting. The good news is that the top heart surgeon in Memphis is performing the heart surgery. He's very happy about this. On Saturday my dad (Max) called to tell me that he was going to have to go to the hospital this morning to have a heart catherization and a stent inserted into an artery. He seemed to be ok, so I was ok. This morning I decided to go to the hospital to wait with my step-mom (Jerri). When I got there he was already out and told me that when they went in, they discovered that one artery was 100% clogged and another artery was 50% clogged. Because of this, they were going to have to do bypass surgery. I was glad that I could be there. He and Jerri are doing well, but it's a scary time. As of now the surgery is scheduled for tomorrow morning. Last night I walked our church through our new membership covenant. I've been working on this for about six months, and it was really great to finally be at this point in the life of our church. I shared three phases that people move through, and I wanted to put it here as well. I stole some of this language from my friend Hugh Halter, who co-wrote the excellent book The Tangible Kingdom. If you'd like to hear the message, you can download it from our website or subscribe via Itunes. This is the Inclusive Community. Anyone is welcome, no matter what you believe, how you live, what you look like, where you come from, etc. This is the “Come and See” message of Jesus (John 1). And it’s not just “come on Sunday night and see.” It’s “Observe how we live, how we care for one another, and how we love our neighbor as ourselves. Just come and be with us. We recognize that many of us have lots of baggage and wounds when it comes to church. Our hope is that over time, people will like what they “come and see.” If they’ve had stereotypes of what a church is, many of these will have been broken through. If they’ve had baggage and wounds, many of these will have been healed through our time together. This phase occurs when people begin to participate relationally, or to serve, or to give. No matter what phase you are in, we will continue to issue the call to follow Jesus. We will call you to give your life for His mission and for the instrument that He has chosen to carry out His mission: the local church. Those of you who answer that call move to the third phase, which is partnership, or ownership. This is where you decide that this mission isn’t just about Robert and Jason. You recognize that God has called you here. Whereas the message of Observation was "Come and see," the message of Partnership is “Come and die” (Mark 8:34-35). Those of us who are called into partnership together for a covenant community. The newest audio from Acts 29 Network features Mark Driscoll speaking about the Mission and Values of the network. Go here to read the notes as well as to download the audio. I have been loving my ESV Study Bible. Here's a good review of it. I think the best part is the online version. When you purchase the Bible you get a code that gives you access to all of the many online features. A few months ago I helped to start a church planting network here in Memphis. I've been watching and learning from Jonathan Dodson and the others that he is partnering with in Austin, TX. Here is their church planting network website (under construction). I also just ran across Summit Church's Church Planting Center in Durham, NC. Hugh Halter on Money and Membership. We're in the midst of formalizing a membership process at Neighborhood Church, so this was very helpful to me. I found this one on Ben Witherington's blog. Make sure you also check out the Redneck Powerball Winner. Yesterday the front page of the Commercial Appeal featured a story on the effects of the economic crisis on Memphis' private schools. It seems that more and more people are going to begin sending their children back to public schools because of this. I feel for the private schools, but I also am once again very hopeful that this will be a good thing for Memphis in the long run. This quote of the day comes from this morning's Fox local news. It's been close to 70 years since the Japanese bombed Pearl Harbor...big mistake on their part. This morning my three year old, Adam, as he was about to leave for school, came up to me and said the following: "Did you know that sometimes tumbleweeds and vines are obstacles?" My response: "Thank you. I'll keep that in mind today." Apparently he learned this from watching Backyardigans.